ABT (arts based therapy) is evidence-based use of art forms to accomplish individualized goals within a therapeutic relationship. The practice of ABT is based on use of various art forms like music, drama, visual arts etc, to address specific therapeutic goals. The ABT model for India was customized & structured by WCCL Foundation in 2005-06, during a project supported by the Sir Dorabji Tata Trust & Allied Trusts. ABT derives theoretical basis from the Indian Mind Traditions, notably Buddhist Psychology and Ethics further interfaced with information from Physics, Neurosciences and Contemporary Psychology. The Artistic Tools for therapy are derived from the works of Dr. Sue Jennings, Arthur Hull, Heather MacTavish and Eastern traditions of Sacred Spaces, Mandals, and Zen. Since 2006, the model has been systematically implemented in various NGOs/Institutions in India. WCCL-Trained ABT practitioners have put the model through the rigours of long-term action research whilst working with various special needs populations, resulting in more than 220 research reports. The theoretical framework has been rigourously refined with the help of Scholars and Practitioners from the Indian Mind Traditions. The rigour of action research in the field and continuous dialogue with scholars ensures that the model is improved and kept current, as evidenced by fact that the handbooks are already in their fourth edition. 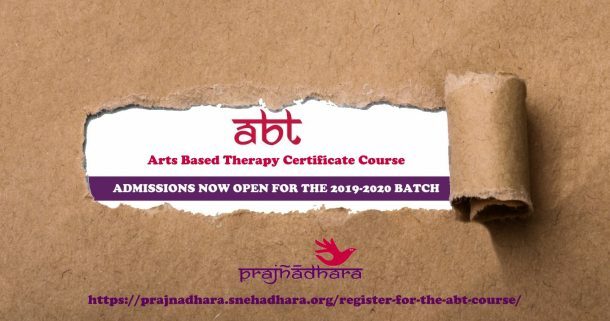 The ABT model aspires to combine Indian Mind Traditions and Creative Approaches to Therapy. ABT is primarily an art form, practised scientifically, and based on the Subtle Energy Guide (SEG), organized and consistently practiced by the World Centre for Creative Learning Foundation [WCCL Foundation] since 2001. WCCL Foundation has over the last decades, worked and enabled over 300+ students in a number of Disability and Development areas, including de-addiction, children and women at risk, persons, especially children, with mental and multiple disabilities, mental health, palliative care, cancer care, dementias, Parkinson’s, etc. WCCLF has also created an evidence base of the day to day effectiveness of ABT in diverse settings-among a diversity of people with needs. Children with special needs:Children in special schools, with a range of intellectual disability, Cerebral Palsy, physical disabilities, on the Autism spectrum, and such. Children at-risk:Children with psycho-social needs, in orphanages, in cancer treatment or palliative care, in government institutions, living in at-risk zones (economic or social), girls who are victims of trafficking, survivors of domestic violence, sexual abuse, and such. Adults: Rehabilitation or After-Care for substance abuse, in institutional care or in treatment for mental health concerns, in palliative care, women in at-risk situations, victims of trafficking and such. ABT can be practiced in a group or with individual clients, dyads or triads. In the case of halfway homes, de-addiction centres etc, ABT can be applied to a ‘floating population’ wherein, the members keep changing, but they are coming with similar issues. The theoretical foundations of ABT are rooted in Buddhist Philosophy from the Nalanda Tradition. A variety of assessment domains are charted out, and they help focus awareness on a particular dimension of the client. As the client is perceived holistically, it is possible to set correct therapeutic goals for their healing (WCCLF 2013). Multiple tools and methods like – Rating Scales, Observation Checklists, Standard Tests, Audio-Visual documentation, and artistic tools – are assembled together to reflect the progress or changes noted in a client / group over a period of time in the ABT intervention.